Since I can't give you all real candy for Valentine's Day, how about a little eye candy instead. 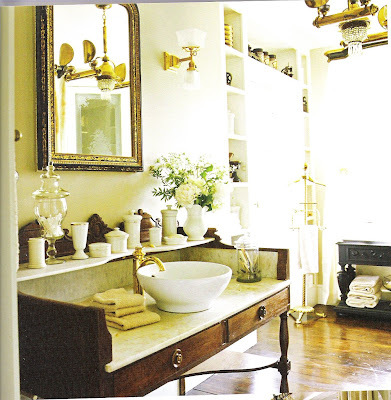 A collection of pretty bathrooms for your enjoyment. 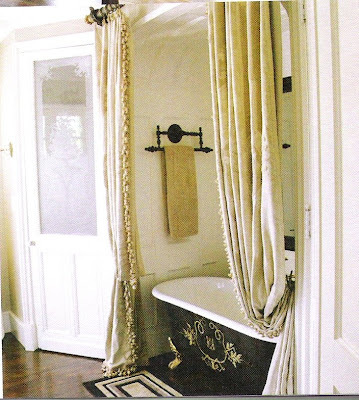 This is a bath done by Amy Howard in her own home. I simply love her window treatment idea. She took antique doors and installed them like shutters on a sliding track. She concealed the track with decorative moulding. Open for light, closed for privacy. Very creative! 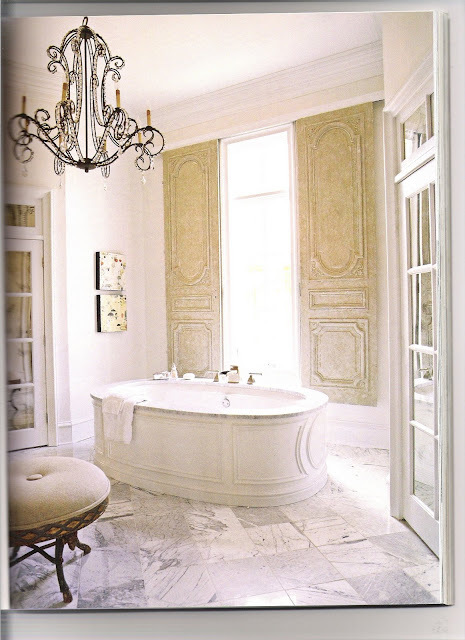 The carrara marble floors and mirrored doors in the room make everything cool and reflective. I absolutely love all the silver going on here! The hammered nickel sinks are a little different take on the more common copper ones I have seen. 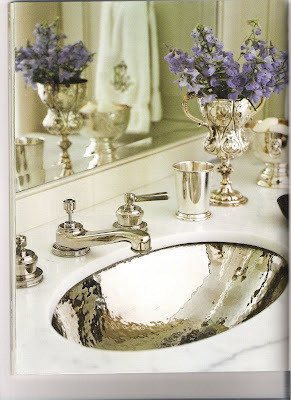 It just looks so elegant and works so well with polished chrome or nickel fixtures and, of course, a Southern girl's antique silver collection! This photo is in the same bath as the one above. I included this room because it is clean but elegant. 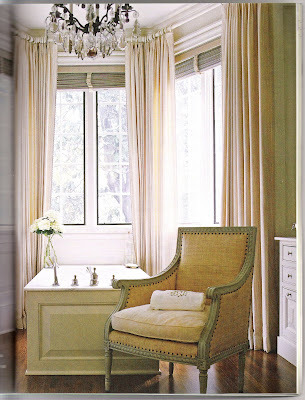 And, of course, the French bergere was the first thing to catch my eye. Love the raffia upholstery and the finish. The full-length draperies instead of shades or valances play up the tall windows and the crystal chandelier is gorgeous. I like the way the tub is placed in the center of the room. It gives it focal point status. I think the word "bathroom" may not do this room justice. It looks more like something in Marie Antoinette's private chamber. But I love it. Again, the tub is placed in the center of the room. I think all the unexpected furniture such as the coffee table next to the tub is fabulous. Of course, the antique duchesse brisee is so glamourous. (I can imagine doing a spa day here for sure.) The curtain treatment is clever, giving the illusion of separate rooms. Lest you think I am only drawn to light cabinetry, here is a little change of pace. More vintage in feel, with an antique baker's table used as a sink cabinet with a vessel sink recalling an antique wash basin. Another antique piece holds folded towels. Same room, with a view of the curtained claw foot tub. Like the monogram on black! Essential elements are here: Creamy cabinetry, crystal sconces and chandelier, natural stone floors, and a French chair. 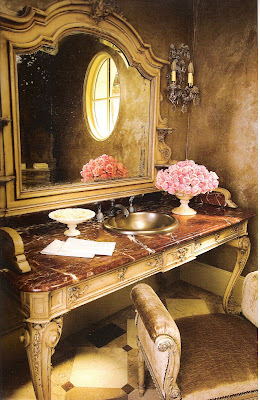 A veddy French powder room. And another. 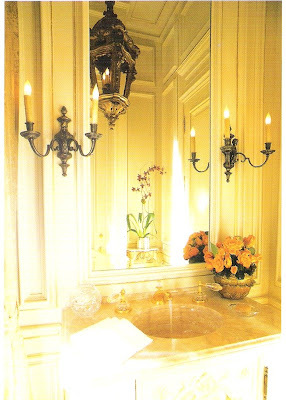 Lantern, sconces, and gold marble, all good. Last and most certainly least, a bathroom from my portfolio. (Unfortunate sconces not my choice!) But I did like the tub area. Hope you have enjoyed the tour. A lot less calories than Godiva! 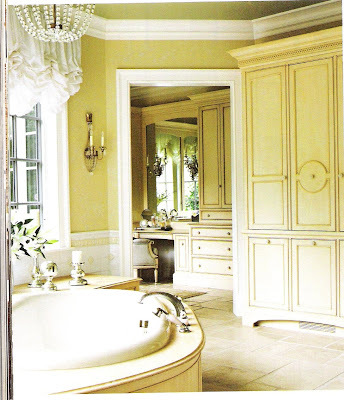 Gorgeous bathrooms, along with Joni I love the carrara marble. I have to agree with you on the Lighting choice in the last picture, The sconces look out of place in that wonderful bathroom. I DO love! you know = clipping pictures of what you love is the best way to organize your thoughts about decorating. It really really helps to see a pattern and then go with it - beautiful post!! !